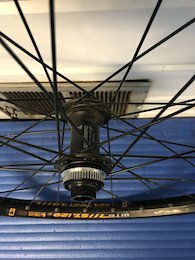 29er wheel set with SLX hubs, ridden a handful of times before replacing the wheel set. No crashes straight and true, non-boost. Shipping is by buyer. Used Rock Shox Revelation RCT 29'er, 140 mm of travel. New RCT Damper and service, has marks etc. Stantions are clean. Shipping by buyer.